Amethyst Games has launched a Kickstarter campaign for Kingship. The game is similar to Crazy Eights, for those that've played that. The object is to empty out your hand of cards. However, each card has a special ability when played or paired up with other cards. And you don't want to jump out ahead too fast, lest you become a target of said special abilities. 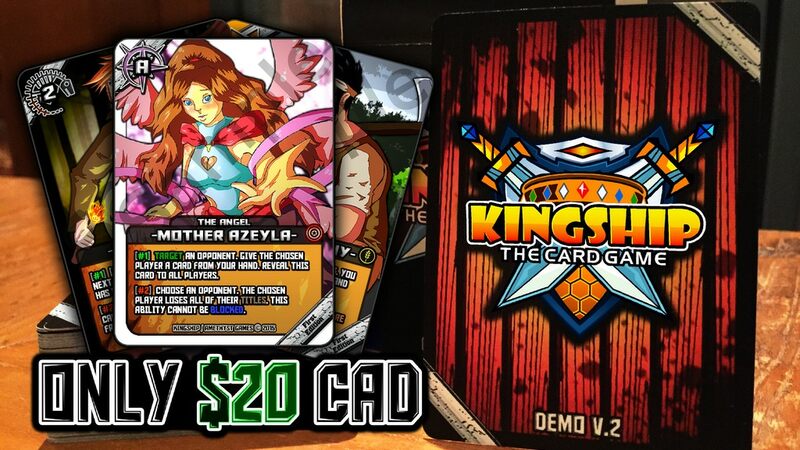 Kingship is a complex but easy to learn card game developed by Amethyst Games. Players must compete against their opponents to become the first player to use (or lose) all of their cards. Anyone familiar with the popular card game “Crazy Eights” with be able to jump into a game of Kingship right off the bat. Match the suit or number value to play a card and trigger its awesome card abilities! It is important to remember however that the closer you are to victory, the greater the chance you will become a target. That is why it’s often a good idea to remain passive at the start and wait for another player to make the first move. For once a is declared, any player may acquire , and from there, they can literally change the rules of the game. The campaign's a bit more than halfway to its goal with still 19 days left to go.